Kaka is a player that maybe on the decline, but there is no doubt that this player has huge amounts of ability. Kaka was the best player in the World from 2006 to 2007, and was unstoppable whenever he played. Since then, injuries have caused his form to drop, and perhaps not as quick as he used to be, but if he was to recapture his form, then Real Madrid will be even more than force than they are now. Kaka is one of many Brazilian icons, as he has the ‘Brazilian flair’ as he combines his hard work to his natural football ability. A fantastic player which will be remembered for many years to come, but are his good days over, or can he overcome his few disappointing years and return to his best. 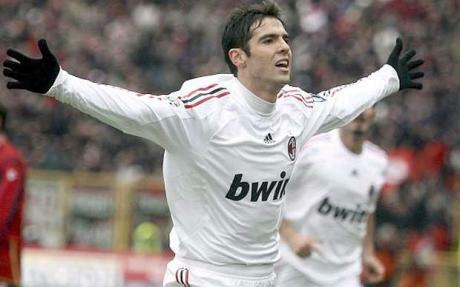 Kaka made his big move in 2003 to AC Milan after being impressive for Sao Paulo. Kaka would join a team who were one of the best in the world at the time, and had many other great midfielders such as Pirlo, Seedorf and Gattuso but Kaka was to quickly gel with them and be a part of arguably the best midfield and best team of the time. AC Milan won the Champions League in 2003, but Kaka was on the bench. Kaka would support Shevchenko up front, and it turned out to be a good combination. The 2006/2007 season is where Kaka produced his best football, and was rated as the best player in the world. He took apart Manchester United in the semi final of the Champions League, which Milan went on to win the competition. There is no doubt Kaka is one of the best players of this generation but maybe his best days are now behind him. Since joining Real Madrid for over £50million, you’d think his career would go up another level, but that wasn’t to be the case. He has picked up a few injuries, and doesn’t look the same player he was. He was uncontrollable in his Milan days, to the same extent Lionel Messi is now. However, since joining Real Madrid he has had ups and downs. There were signs towards the end of last season that he still had the ability, and with a full pre season this time around, we may expect better from him. He is playing with the likes of Ronaldo and Ozil, and Kaka should shine with this players, only time will tell.